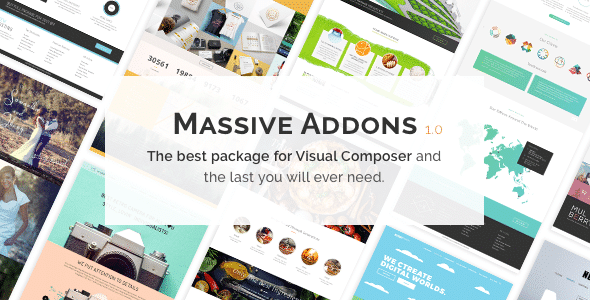 Instantly download the Massive Addons for Visual Composer plugin at a large discount, with 1 year of updates. No coupon code required, just “Add to cart”! Hello, in May 2015 we have set out to create The Best Visual Composer addon with all the bells and whistles that you expect from such package. After 8 months we have ended up with Massive Addons and we think it is awesome! Learn All about it below, and thank you for your interest! We are working as designers and developers for over a decade, you can say we know our way around the web Visual Composer is our go to page builder for years and that’s why we know it’s advantages and drawbacks. At the beginning we have investigated what is wrong with current addon packages and VC itself. Most of the packages are slow, heavy weight and does not look good. Each time you want to change something you need to go through tons of settings to achieve the same look. There is no easy way to easily create stuff with few clicks and that got us thinking. We came up with Presets. Basically presets are “templates” of styles & layouts for your shortcodes. With presets you can recreate any layout anywhere on the website with just one click. Of course you can create your own presets, edit the build in package (there are over 1700 presets) or delete those you do not need anymore. But this wasn’t our only assumption. It had to be easy to use, fast, reliable eye-catching. To give our users full control we have created lots of settings, but we also wanted it to look welcoming and simple. That’s why we have created Easy Mode. It displays only the necessary settings and hides the rest. We created the easiest workflow possible: load preset, change (for example) content, save and you are done. Optimization was also a key assumption. We have spent a lot of time on it and scored an “A” grade on gTmetrix with almost 100% score. Be the first to review “Massive Addons for WPBakery Page Builder” Click here to cancel reply.